Say hello to Audi's new, third-gen Audi TT which, they believe, is a return to the form for one of the brand’s most important cars. There's nothing excessively different from a visual point of view, just some styling tweaks as we've come to expect. Rather, it's a petrol-only 2.0-litre engine line-up with more technology that is the kicker and Audi believe the new model denotes a solid upgrade over its predecessors. Let's just take a second to establish exactly how important the TT is for the company from Ingolstadt. During 20 years and three iterations of Audi's roadster/coupe sports car around 600 000 vehicles have been sold, with its biggest markets being the UK, Germany, the USA and Japan. It’s still a landmark for the company – especially in design – which makes it very important then. Speaking to carmagazine.co.uk, TT product manager, Jens Meier, said, "The Mk1 TT introduced a totally new design language at the time, visionary. No other product in the Audi range represented image and sportiness in the late ‘90s more than this car. New cars are introduced every day; very few cars are capable of such inspiration." Which leads us to this 2019 model and, according to Audi, the TT has been updated in three key areas: sportiness, engines and technology. On the outside, the single-frame grille has a more imposing, 3D design to compliment some fresh exterior colours, upgraded LED rear lights and new 18 to 20-inch alloy wheels round off the basics. There are polished Audi rings branding the side of the car just in front of the rear wheel arch, which might not be to everyone's taste. All the new models come with a host of standard features, including auto-headlamps and rain-sensors, a multi-functional steering wheel and heated exterior mirrors. Virtual Cockpit will now come with the sports mode as standard, so you can easily see things like torque, and power in the cockpit dials. Peeking under the hood reveals a 2.0-litre powerplant in various states of tune. 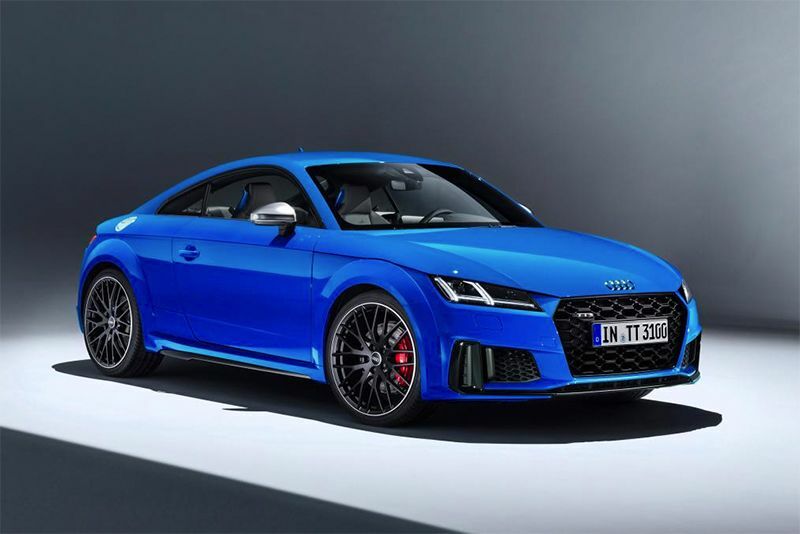 The car will be coming out in 40 TFSi (194bhp/320Nm), 45 TFSi (245bhp/370Nm) and TTS trims (302bhp/400Nm) – the latter equipped with Quattro and a new seven-speed S-Tronic gearbox that will hit 0-62mph in just 4.5 seconds. You may have noticed the lack of a diesel in the lineup. According to Meir; "We decided really early to remove diesel. It's not suitable for some markets but for us, for the future of the TT, it made no sense to continue it. We’ve left Le Mans with diesel after all." There is more though. The grey drop-top in the gallery above is actually a special edition of the new model designed to commemorate 20 years of the TT. It features the same grey paint and tan interior with baseball stitching of the original. It sports 19-inch wheels and features chrome-tipped exhaust tailpipes and black brake callipers. Only 999 will be made, including both roadster and coupe body types. Later down the line, Audi promises a hot RS version using the same five-cylinder engine as the current model but tuned to push out 400bhp. And that sounds exciting.